Yesterday was the first day of a stock price reversal after a hefty rally. Against 2009 trough valuations, small caps are trading at deeper discounts than the large caps. Oil price appears to have turned the corner but we expect poor corporate news throughout 2016. Stock prices will be volatile amid this tug of war. Accumulate selectively on pull-backs. Our top BUYs are Keppel Corp and Ezion Holdings while top SELLs remain SMM and Nam Cheong. • Accumulate selectively after a share price pull-back. 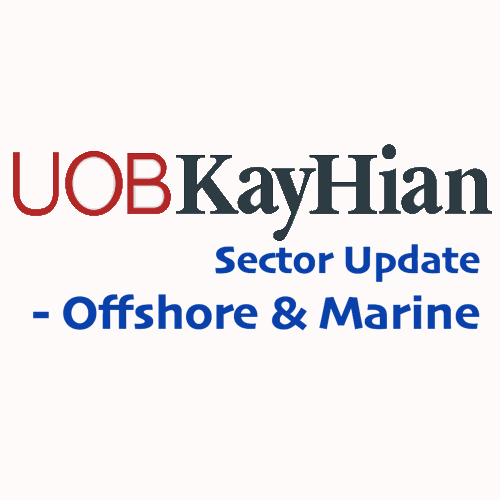 The offshore & marine (O&M) sector has rallied 20% since the beginning of last week. Large-cap rig builders (Keppel Corp (Keppel), Sembcorp Industries (SCI) and Sembcorp Marine (SMM)) have appreciated by 10% on average (12%, 9% and 9% respectively). Separately, small-cap oil-service stocks have appreciated by 18%. The top gainers were Ezra (+64%) and its subsidiary Emas Offshore (+38%). Yesterday, stock prices started to reverse. In our retail monitor, we provide our technical views on Keppel, SMM and Ezion. • On a longer-term perspective, the sector is still deep in value. O&M stocks have dropped by 70-90% since the oil price collapse began in Nov 14. The longer-term risk return trade-off of the sector remains favourable. The longer-term prognosis on oil price is a higher level 1-2 years from now. Stock prices remain highly volatile in the short term as companies are now seeing a full-blown negative impact of the deep cut in exploration & production (E&P) spending by oil companies. However, in a longer-term perspective, the O&M sector is still deep in value. Jan 16 saw stock prices hitting their P/B troughs that are lower than 2009’s. • Large caps - valuation divergence. Keppel and SMM saw a lower trough P/B in the current O&G downturn than 2009’s. Keppel and SMM fell to 2016F P/B of 0.7x and 1.1x respectively in January this year, lower than their respective trough P/B of 1.1x and 1.4x in 2009. SCI hit a trough P/B of 0.9x, lower than the trough of 1.1x in 2009. Following recent stock price gains, Keppel, SMM and SCI now trade at 2016F P/B of 1.0x, 1.4x and 0.9x respectively. Excluding SMM, which is trading near its 2009 trough P/B, the others are trading at a 12-15% discount to their 2009 troughs. However, all three are trading at a steep 51% discount to their average P/B since 2009. • Among large caps, we see a divergence in valuations with SMM seeing a greater de-rating. Keppel has mitigated the impact of the oil & gas (O&G) downturn with the privatisation of Keppel Land, while SCI continues to expand its utilities business to diversify further from O&G. its hefty valuation premium to regional shipyard peers prior to the current O&G downturn. We expect SMM’s de-rating to continue as more rig cancellations come to pass. Against an average 2016F P/B of 0.55x for South Korean and Japanese offshore heavy-engineering shipyards, SMM’s 2016F P/B of 1.35x is 145% higher. We estimate a potential asset impairment of S$663m after tax relating to the 7 risky rig orders. SMM’s lowest P/B ever was 0.85x during the Asian financial crisis (AFC). Maintain BUY on Keppel and SCI, and SELL on SMM. We recommend accumulation after a share-price pullback. • Small-cap oil service stocks - current P/Bs are 15-51% below 2009 troughs. As a whole, the small caps are deeper in value than the large caps. The oil service sector comprises three segments: OSV owners, OSV shipyards and subsea contractors. These three segments currently trade at 2016F P.B of 0.41x, 0.35x and 0.17x respectively. This is well below their 2009 trough P/B of 0.48x, 0.72x and 0.31x. Today, the companies generally have a higher net gearing compared with 2009 levels amid a steeper cut in E&P spending. That said, current P/Bs are already at steep discounts of 15-51% to 2009 trough valuations and 62-78% discounts to the average P/Bs in the period 2009 to present. EMAS Offshore (Ezra’s OSV-owner subsidiary) has the lowest P/B of 0.08x, while Mermaid Maritime has the strongest balance sheet with only a net gearing of 16%. However, our stock picks continue to centre on companies that have relatively earnings resilience, good management and are actively managing the impact of the current downturn. Our top BUY remains Ezion. Maintain SELL on Nam Cheong. • Oil remains oversupplied in the short term. Post IHS Ceraweek (22-26 Feb 16), Brent oil price rebounded 16% from US$35.10/bbl to US$40.84/bbl. The oil market seems to be looking past current oversupply issues. Case in point, the oil market shrugged off last week’s record US inventory build of 10.3m bbl as well as the recent output freeze which hardly alleviated the oversupply situation. Current supply still remains in excess of 2.2mb/d over demand, and demand growth remains lower at 1.2mb/d vs last year’s 1.6mb/d. The IEA is scheduled to release its March Oil Monthly Market report this Friday. In its last monthly report, the IEA forecasted oil demand-supply to balance in 2017. • A long negotiation on production unfolds. Last month, Saudi Arabia, Qatar, Venezuela and Russia were reported to have met to discuss the oversupply situation. Although the outcome of the meeting was inconclusive, news of the meeting alone prompted an 11% rise in Brent oil price. OPEC and non-OPEC members will convene again between 20 March and 1 April to discuss details on the output freeze. We see this as the beginning of a long road of negotiations to agree on a solution to the current oil oversupply. • Revising our oil price assumptions. We revise down our oil price assumptions as the 27 agencies we track made large downgrades that exceeded our 5% tolerance. Our new assumptions are US$42/bbl for 2016 and US$54/bbl for 2017. Given the average between both, we maintain our US$50/bbl assumption for our stocks’ target prices.